“Think of this refreshing soup as liquid salsa ─ plenty of garden-fresh flavors in a bowl,” says Mii amo. 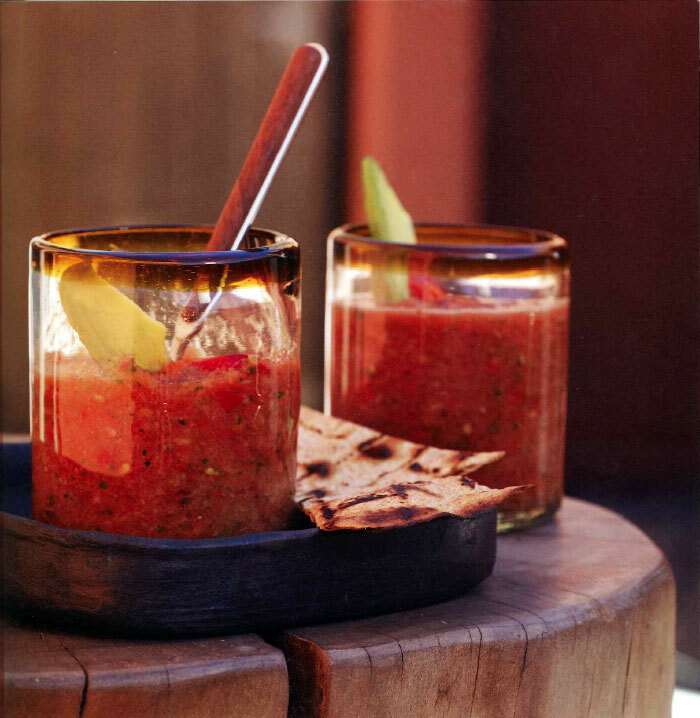 Refreshing gazpacho is just what summer is for, and this traditional tomato gazpacho from Mii amo in Sedona, Arizona, incorporates a bevy of herbs and vegetables to give you your daily dose in a deliciously cold summer soup. Tip: Depending upon the acid content of the tomatoes, you may need to add an extra teaspoon or two of vinegar at the end to perk up the taste. If craving gazpacho in the winter when good tomatoes are unavailable, substitute the best-quality canned tomatoes you can find. This tastes best when allowed to marinate overnight. Working in batches as needed, combine the tomatoes, cucumber, onion, bell pepper, cilantro, basil, both vinegars, oregano, garlic and oil in a blender or food processor. Process, pulsing the machine on and off, until the vegetables are finely chopped and have released their juices. Pour the mixture into a large bowl and season to taste with salt and pepper. If needed, add more white balsamic vinegar to balance the flavors. Cover and refrigerate for at least 2 hours or overnight to blend flavors. Serve chilled.